The great thing about making your own foods, rather than buying them, is you know EXACTLY what is in the food. You get fresher, healthier foods with less chemicals. You can also more accurately track the nutritional values of the food. 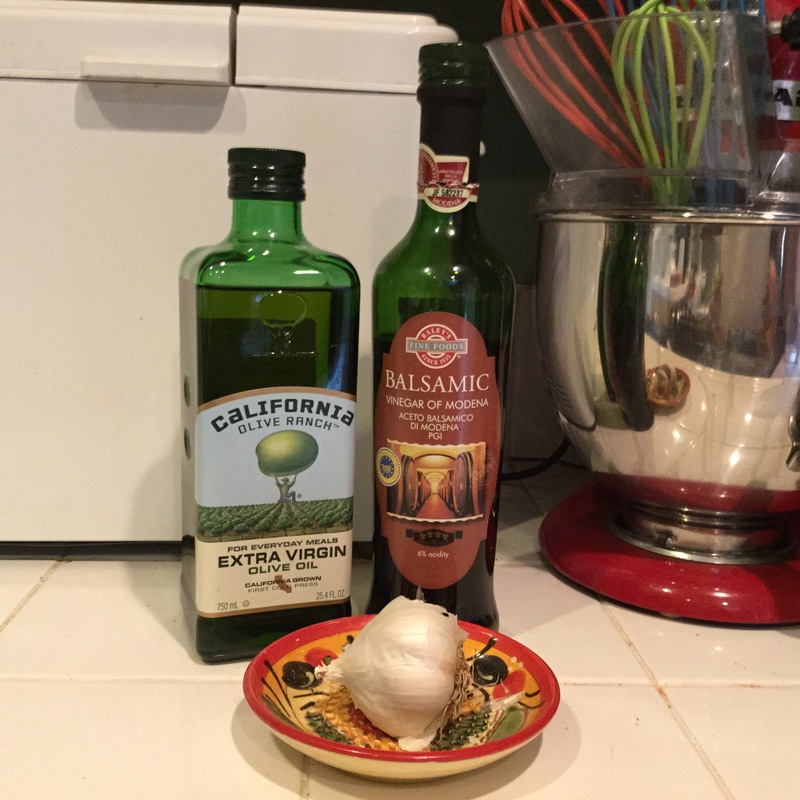 Today I thought I would share my super-easy to make Balsamic Vinaigrette recipe. It’s so tasty and versatile. In addition to using it on green salads, I’ve used it on my Southwestern Layered Salad (see previous post for recipe) and as a meat marinade on both chicken and beef. Another great thing about this recipe, is that you can adjust the oil to vinegar ratio to fit your taste or fat content desires. I usually go 50/50, but at times I do use more vinegar to lower the fat content. Balsamic vinegar is such a mild vinegar, you can get away with doing this and still get good flavor. Note: My recipe is based on the size of my salad dressing container. Adjust quantities to suit your needs. Put all ingredients in your container, shake or whisk vigorously and enjoy! Tip: When dining out, don’t be afraid to bring your own salad dressing. Dressings can be a diet killer! I do this all the time. I just order my salad with no dressing or dressing on the side. I take a little teasing, but hey! They don’t have to wrestle my bod into jeans!!! 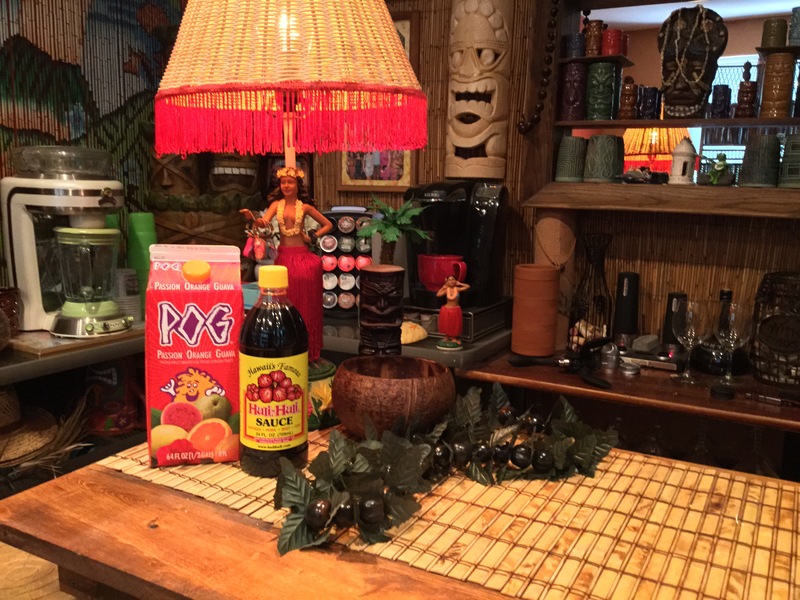 Huli Huli Sauce and POG: Aloha! We’re Going Hawaiian Today! Yes, folks! This is a peek inside my house! I swear! Now our whole house doesn’t look like this, just the tiki bar tucked in the corner of our family room. Our family has been blessed with the opportunity to visit Hawaii a few times and we have fallen in love with the culture there! Not only is the landscape gorgeous and the food delicious, but the people are so warm and welcoming. They proudly share their culture with visitors and as they should! They have a lot to be proud of! So as you can see, our family has chosen to insert bits and pieces of that culture into our lives. The flavors of Hawaii are something we incorporate on a very regular basis! The two products shown in the picture are staples in our house. We were originally introduced to both of these items in Hawaii. As I type this, there are two cartons of POG in our fridge and 5 bottles of Huli Huli sauce in my pantry (Overkill on the sauce, I know, but if you knew my husband’s shopping habits you would understand!). So what are these tropical delights you ask and where can you get them??? POG is actually an acronym for Passion Fruit, Orange, Guava, the three juices that combined make POG. Our whole family loves this juice, young and old alike! The adults have been known to sneak a little rum in theirs on occasion to make a wonderful mai tai. We live in Northern California and have found POG to be available at Fresh and Easy markets and at the Nob Hill/Raley’s chain stores with the other refrigerated juices. If you can’t find it in your store, ask and maybe they can order it. This is a soy sauce based sauce that is very versatile. It can be used with chicken (it’s most well known use! ), beef, pork or fish. We use it frequently to marinate chicken prior to barbecuing. You can also use Huli Huli as a stir fry sauce, to make gravy sauce or on baked meats. There are various recipes on the bottle. We used to have to bring the sauce back with us from trips to Hawaii, but then I was in Cost Plus one day and low and behold, there it was!!! Score! Now we’ve had a regular, mainland source for one of our favorite ingredients! If you don’t have Cost Plus markets near you, check with other stores carrying international foods and you might find it there or again just ask at your local market. I hope you’re able to find these items and give them a try. They are both really delicious and bring a refreshing, tropical spice to life! Aloha!